Introduction: 68Ga-radiopharmaceuticals are common in the field of Nuclear Medicine to visualize receptor-mediated processes. In contrast to straightforward labeling procedures for clinical applications, preclinical in vitro and in vivo applications are hampered for reasons like e.g. volume restriction, activity concentration, molar activity and osmolality. Therefore, we developed a semi-automatic system specifically to overcome these problems. A difficulty appeared unexpectedly, as intrinsic trace metals derived from eluate (Zn, Fe and Cu) are concentrated as well in amounts that influence radiochemical yield and thus lower molar activity. Methods: To purify Gallium-68 and to reduce the high elution volume of a 68Ga-generator, a NaCl-based method using a column containing PS-H+ was implemented in a low volume PEEK system. Influence on reducing osmolality, acidity and the amount of PS-H+ resin (15–50 mg) was investigated. 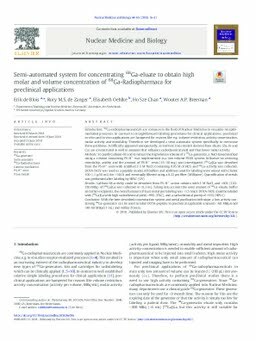 [68Ga]Ga was desorbed from the PS-H+ resin with acidified 2-5 M NaCl (containing 0.05 M of HCl) and 68Ga-activity was collected. DOTA-TATE was used as a peptide model. All buffers and additives used for labeling were mixed with Chelex 100 (~1 g/50 mL) for >144 h and eventually filtered using a 0.22 μm filter (Millipore). Quantification of metals was performed after labeling by HPLC (UV). Results: Gallium-68 activity could be desorbed from PS-H+ cation column with 3 M NaCl, and >60% (120–180 MBq) of [68Ga]Ga was collected in <0.3 mL. Taking into account the used amount of 68Ga-eluate, buffer and other excipients, the overall amount of trace metal per labeling was <1.5 nmol. DOTA-TATE could be labeled with [68Ga]Ga with high radiochemical yield, >99% (ITLC), and a radiochemical purity of >95% (HPLC). Conclusion: With the here described concentration system and metal purification technique, a low activity containing 68Ga-generator can be used to label DOTA-peptide in preclinical applicable amounts >60 MBq/nmol (40–60 MBq/0.1 mL) and within 20 min.